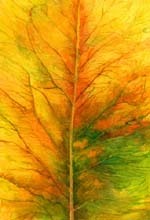 Born in 1959, from Hong Kong, Mak paints nature studies of Autumn leaves. These carefully rendered still life enlargements hold metaphorical meanings to deep emotional concepts for the artists and viewers alike. Mak has been painting for 10 years while working full time as an architect.